Florescencism is an artistic concept which is socially and spiritually conscious. It is a result of this painter’s years of research. The floral language in the paintings picks up where Georgia O'Keeffe (1887–1986) left off on flower painting, but adds a touch of finesse from Persian contemporary miniatures by Mahmoud Farshchian (born in 1930), and spirituality. The philosophical thoughts behind the work come from the academic social science research on peace scholars’ propositions of past and present, matching minds from the East and the West. I was born in Iran in 1977, and as a child witnessed both the Islamic Revolution of 1979, the eight year Iran-Iraq war, and later on also the Gulf War of 1991 just before leaving Iran. Khorramshahr my birth city was completely destroyed in the war, and members of family and friends died, both in bombardments and executions by the newly formed regime. Seeing people dying in war and executions, has made me question why cannot we humans live in peace happily, sing, dance and enjoy each other’s presence instead of such horrendous violent way of acting. The intellectual search for answers to these questions, and the desire of my heart to see people happy, as well as my aesthetic sensitivies and passion for beauty, have brought me to paint what I paint today. While searching for my authenticity as a painter, and deepening my understanding of beauty as well as our connection to beauty as humans, I came to discover the works of professor Vilayanur S. Ramachandran on the evolutionary origins of art and aesthetics, the cognitive science of art, and the neurology of humans’ aesthetic experience. This florescencism way of painting, is (so far) made of nine main pillars in its visual characteristics, eight of which coincide with the ‘the eight laws of artistic experience’ which V.S. Ramachandran and William Hirstein explain in their neurological theory of art (2011). It is through this neurological understanding that I could build the visual pillars, which can transcend cultural, educational, status, or other social barriers for viewers (and myself as their creator) when connecting to the art work. The large number of multiplication of flowers with perspective creating depth of imagery creates a sense of abundance and growth. This is a humble attempt to create a counterpoising space to the feeling of scarcity and fear in times of economic crisis. Hundreds, or at times even thousand of flowers give a sense of overflow and surplus. 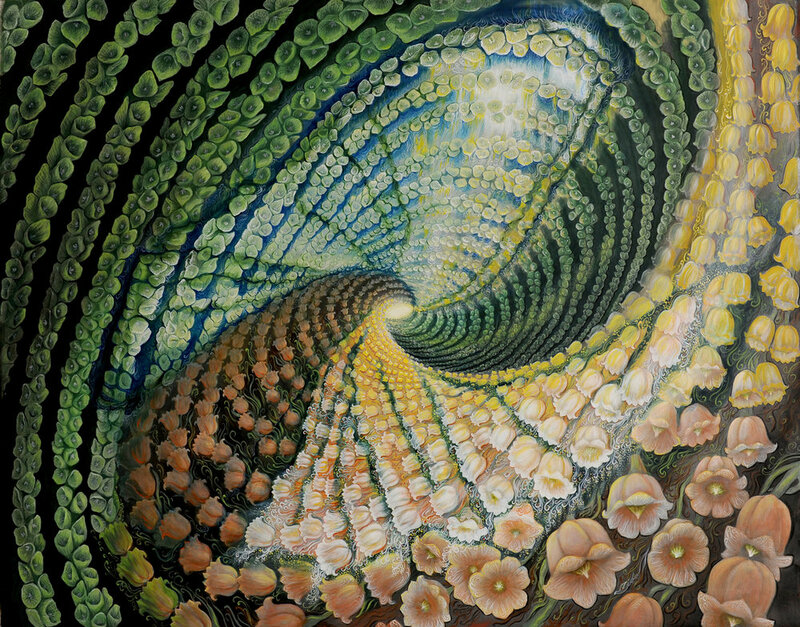 The repetitive flowers flow in a direction, the repetition of their shapes besides creating a soft rhythmic also guides the eyes inwards to the point of infinity in the picture (the point of infinity is explained below) and outwards towards the surface. At the same time this directionality and movement reconnect one to actual physical movement thus a sense of progression and evolution, a flow and a wonder. As the flowers move farther away they get less clearly defined and practically disappear into a white light area, almost like when the seven colours of the rainbow become the white light they lose their distinction from each other. That mysterious light represents the common yet unknown root which surfaces every time we try to go deep into things. The deeper we go from the surface, the less distinct we become; meanings and definitions also lose their distinguishing elements including our very words in linguistics. This luminous mysterious light as a point of infinity, thus brings us face to face with our depth of interconnectedness and common link whereby nothing seems distinguishable when we go deep, there is only one encompassing entity. It might be argued why the point of infinity is not presented in black like the pitch dark infinite galaxies; well the reason is our neurological archaic recognition of light as life, as enlightenment, as divine, and a pure force, a collective memory (A. Mahlberg, 1987) which from across the globe people seem to connect with. But total darkness -black colour- is seen as loss of life, loss of hope and energy, like an ending. So light is seen as a life continuing itself, while darkness is seen as a life ending itself. The infinity point that I’m referring to in these paintings is a depth of life of which we know neither a beginning nor an ending from what our knowledge stands today; therefore light -white light- represents it to our cognition. The presence of ancient archaic symbols of warmth and beauty frequently appear in the overall image. The Phoenix, the Peacock plumage, and the Mother of Compassion are practically present in all works in one way or other. This reconnects one to roots of humanity, our common roots of civilization as humans going through our evolution with common memories. These ancient archaic symbols come out during long hours of meditation and dance which I do during the painting process. While connecting to the power of imagination and depths of silence through meditation, and spiritual dancing, the imagery matures in my mind’s eye in a way to resonate with that heart’s wish of the blossoming of people (myself and the viewers). I write poems too with each piece which describe the moment of insight in words. But the heart wish and focus is a prayer ‘written’ in painting through the imagery. Somehow this process takes the image to a point whereby a meditative effect does get created even for the viewers. In fact the paintings have been used a number of times during meditation sessions, yoga sessions, and also prayer retreat sessions by religious groups, in order to enable the participants to get in touch with the voice of their heart. William Blake wrote illuminated texts of spiritual angles. In admiration of his work, I thought to integrate the poetry inside the very painting imagery itself although I do have the verbal poems produced too. Much like Georgia O’Keeffe’s paintings the floral design dominates the overall composition design, although tiny flowers are all over the place, but as a whole the structure still makes up a simplified design of organic character. This organic floral structure reconnects one to nature and its living forms. Most flower forms remind one of sensual lines when closely observed; this sensuality though is being put in an air of purity where beauty dominates in a way that touches the soul, thus provoking respect and appreciation of nature’s beauty. Flowers in themselves are most often considered a symbol for woman, and in a world where a soft touch of females seems somewhat lacking or out of balance vis-à-vis male presence, these flowers create a counter-balancing air. It may look quite odd at first to have two seemingly so very different masters’ influences as Georgia O’Keeffe and Mahmoud Farshchian. But in fact a common pull which draws me as a woman of Persian heritage, to the paintings of both is the soft, pure and refine expression of woman in them. Mahmoud Farshchian portrays Persian women in all their delicate, poetic manners, and gentility which lie indeed at the depth of the Persian civilization. 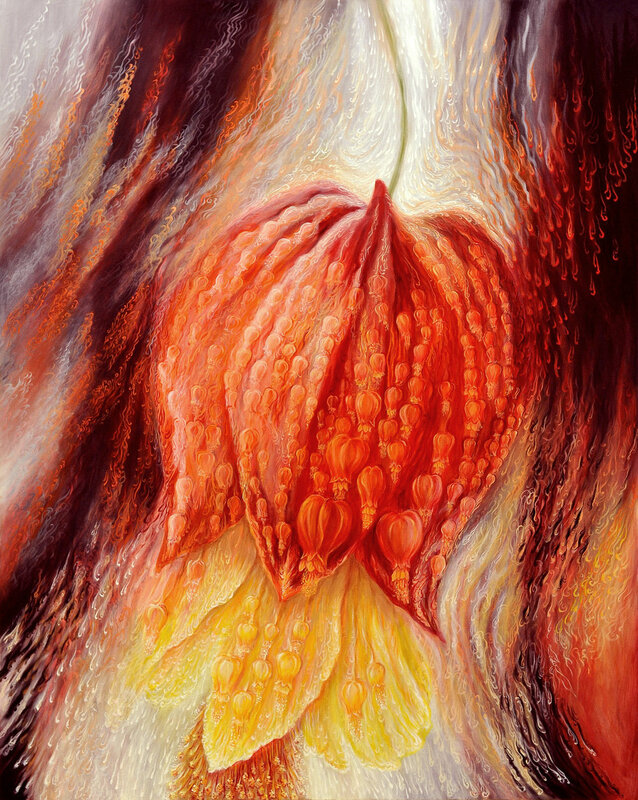 And Georgia O’Keeffe portrays woman as a flower giving large space to the sacred beauty of nature, which connects me to the whole world transcending culture. The colour schemes used are dominated with vibrancy, and this is to emanate a spirit of a life renewing itself, a renewing spirit, a freshness. Much like Mahmoud Farshchian’s Persian miniatures the intricate and graceful use of brush strokes are used like the controlled graceful movements of dancers. The dancing that I do during painting intervals while preparing a piece helps bring out further this effect, because besides the spiritual expression in dance I try to discipline also my physical movements and techniques, so freely expressive but controlled. This controlled yet expressive use of brush strokes is to reflect a conscientious manner of expressing one’s self; whether it is anger, joy, love or resentment, not to lash out our emotions in all directions without any consideration for the recipients who are our receiving environment. This is to express respectful considerate gentleness towards the audience. Every flower in nature seems to have certain healing qualities, which is the subject of study in ‘flower essence remedies’. During the meditations, normally the images of the flowers which I see happen to match in their healing qualities and the over all meaning of the paintings. Thus I make it a point to research the healing qualities of the flowers before outing them in a particular painting. For example if a painting is to create the effect of emotional calm, the flower dandelion is one which helps release tensions and creates emotional calm in flower essence remedies; so the dandelion is selected as the main flower for that painting. This also helps bring us once again in closer contact with nature, and its ways of connecting us to solutions we look for in our difficulties. All the above nine pillars can be identified consistently in all the works. Each visual pillar is the reflection and result of a layer of the research involved. Equally every single brush stroke is done with the focus of heart, mind and body due to the meditation and dance in the painting process. The outcome is meant a resonance of growth and flowering of the human potential, and consideration of others as our receiving environment; a recalling of beauty as a root of ours from which we seem to have somehow disconnected in much of the present art productions today; it recalls gentleness and warmth, and provokes the beauty already innate in us to emanate outside in our life in deep union with nature's beauty. It also stimulates a sense of abundance instead of scarcity which instills fear. It is at the same time a very anti-terrorist stance, by responding through a gentle language. This way of painting with its meditative and dance procedures is an artistic way to emanate the flowering of human potential, the reconnecting to our beauty, the abundance of our spirit, mirroring an image of the vastness and beauty of the viewers' soul and mind. This is specially in response to today's terrorism, and economic crisis by calling in our abundant creative intelligence. When inside us is all dominated by resentment and fear, little room is left to come up with gentle solutions, creative approaches, and little room is left also to enjoy our own existence as individuals and communities. The environmental hazards are also a result of our disconnection from nature, during which in the ways we found for moving forward we somehow skipped the relevance of natural preservation. At this point instead of creating art which raises awareness about the cruelties and environment, or a broken economy, this art creation becomes an action in itself, by creating a state of mind and spirit which allows creative solutions and warmth to be delivered; a counteraction which encourages the development of persons as a way forward. The painting being an expression of that blossoming prompting our intelligence to bloom, therefore contributing to an atmosphere which reflects that spirit of flowering. In order to come up with practical solutions that allow warmth and growth in our international relations, we need first to be in a state of mind which allows those kinds of solutions. As the famous preamble of UNESCO’s constitution states “Since wars begin in the minds of men, it is in the minds of men that the defences of peace must be constructed.” A state of mind of terror doesn’t enable creative non-harmful thinking. Thus allowing an environment which enables our minds is important. Art works displayed in public become part of our physical, emotional and intellectual reality, and therefore they play a role in our surrounding environment even if indirectly. The fact that flowers are beautiful, fresh and serene, does not mean they are not actually real and not part of our existing environment; it is not only harmful bombs which make up the reality around us. Of course bombs do have much more harmful power than beautiful flowers do, but that does not make them more real than the beautiful parts of our life. And just because terror is flowing in the international scene does not mean warmth is unreachable. An example to make this easier to understand is seeing that people managed to invent airplanes after managing to feel the flying sensation and started drawing possibilities of airplanes. This florescence art is a humble attempt to contribute in reflecting the possibility of (if I may say even a heart prayer for) the blossoming of people to become a tangible reality in our environment. Be it in the mist of war, sickness, hunger, or illiteracy, a spirit of hope is a reachable freedom space inside every person, and upon that hope one finds more force to find ways out to develop and ‘flower’. I am painting warmth and soul beauty in public displays of international exposure, trying to give more power and space to beauty (Nicholas Roerich 1930) and hope rather than to destruction and terror, hoping that first in our personal space then in our public collective spheres and international relations too we would start experiencing more tangible warmth and growth.